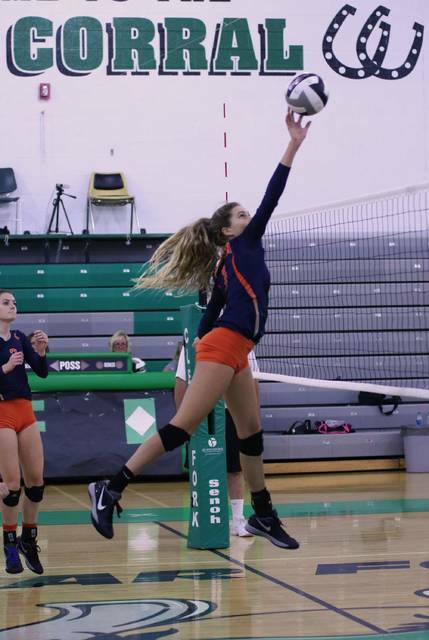 Erin Miller | Galion Inquirer Galion’s Samantha Comer throwing down one of her 10 kills on the night at Clear Fork on Thursday. The Lady Tigers defeated the Lady Colts in three sets and remain unbeaten in the MOAC. BELLVILLE — On Thursday evening, the wins kept on coming for the Galion Lady Tigers volleyball team. Galion traveled to Clear Fork High School to meet up with the Lady Colts and came home still undefeated in the Mid-Ohio Athletic Conference, defeating the hosts; 25-9, 25-16, 25-12. The Lady Tigers improve to 14-3 overall and 11-0 within the conference. The serving for Galion was once again the catalyst to the victory as the visiting Tigers served at a 63/70 clip, earning them 45 points and 11 aces. Leading the way for Galion was Abby Foust. Foust finished the night at 12/13 from the service line with seven points and four aces. Kayla Hardy added three aces for the Lady Tigers, going 11/11 on the serve for seven points. Kasidee Sinclair also finished with three aces on 9/11 serving, earning eight points. Other serving stats for Galion were: Jaden Ivy- 9/9, 5 points, ace; Kate Schieber- 15/17, 14 points; Nicole Thomas- 4/6, 3 points and Gillian Miller- 3/3, point. As for the Galion attack at the net, the usual suspects were active against the Lady Colts. As a team, Galion racked up 44 kills off of 38 team assists. Marisa Gwinner led the way with 14 kills with Samantha Comer contributing 10 kills. Ivy turned in seven kills, Claire Miller threw down a pair of kills while Gillian Miller and Hardy added one apiece. Hardy was the top ball handler for the visiting Tigers, going 69/74 en route to 37 assists. Foust added the final Galion assist on the night. Gwinner and Gillian Miller were stout on the defensive side of the net as well. The blocking duo recorded two blocks apiece for Galion while Hardy, Sinclair and Josie Ehrman added one apiece. In addition to the five official Tigers’ blocks, the visitors accumulated 39 digs on the evening. Dig stats on the night for Galion were: Comer- 8; Hardy and Foust- 6 each; Gwinner and Sinclair- 5 each; Schieber- 4; Ivy- 3 and Thomas- 2. The Lady Tigers will be in action on Saturday against both Buckeye Central and New Riegel in New Washington. League play picks back up for Galion on Tuesday, October 3 when they host the North Union Lady Wildcats in the Volley for the Cure game. https://www.galioninquirer.com/wp-content/uploads/sites/38/2017/09/web1_IMG_0600.jpgErin Miller | Galion Inquirer Galion’s Samantha Comer throwing down one of her 10 kills on the night at Clear Fork on Thursday. The Lady Tigers defeated the Lady Colts in three sets and remain unbeaten in the MOAC.